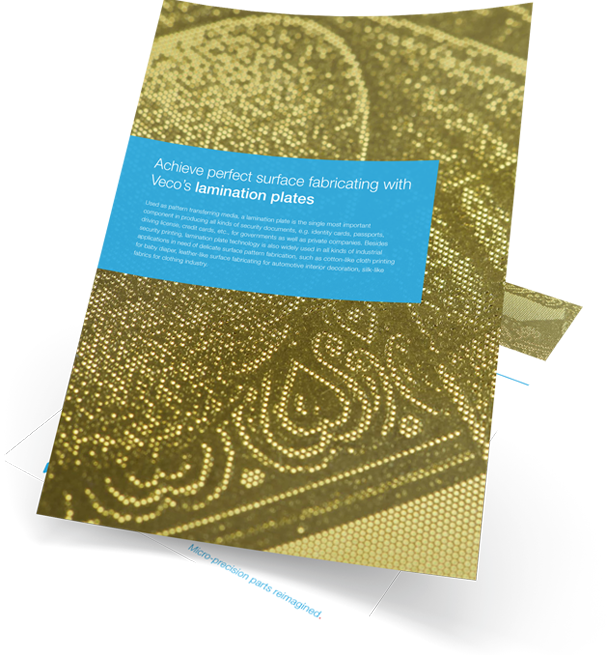 Veco’s lamination plates provide highly flexible solutions for cost effective manufacturing in various industries. Download application note "Lamination Plates"
Download the application note for more information! Lamination plate is the single most important component in producing all kinds of security documents, e.g. identity cards, passports, driving license, credit cards, etc., for governments as well as private companies. Besides security printing, lamination technology is also widely used in all kinds of industrial applications in need of delicate surface pattern fabrication, such as cotton-like cloth printing for baby diaper, leather-like surface fabricating for automotive interior decoration, silk-like fabrics for clothing industry.